Home > HTML5, Visual Studio	> Add Visual Studio 2010 HTML5 Intelligence. Add Visual Studio 2010 HTML5 Intelligence. How to Add Visual Studio 2010 HTML5 Intelligence. So here’s how I got it to work. Download this archive and extract the contents to your desktop. 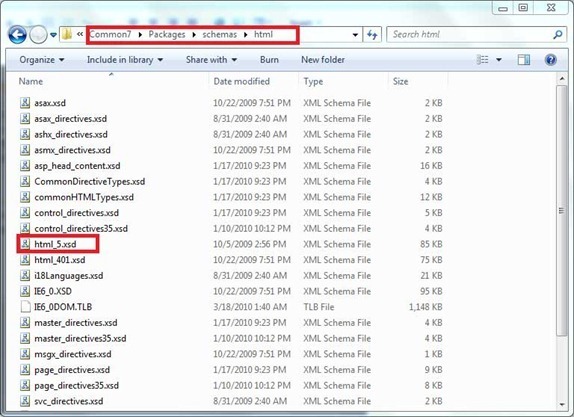 Copy/Movehtml_5.xsd to D:Program Files (x86)Microsoft Visual Studio 10.0Common7Packagesschemashtml. The path may vary depending on where you installed VS 2010..
Now fire up Visual Studio 2010 (or VWD) and navigate to Tools > Options > Text Editor HTML > Validation. 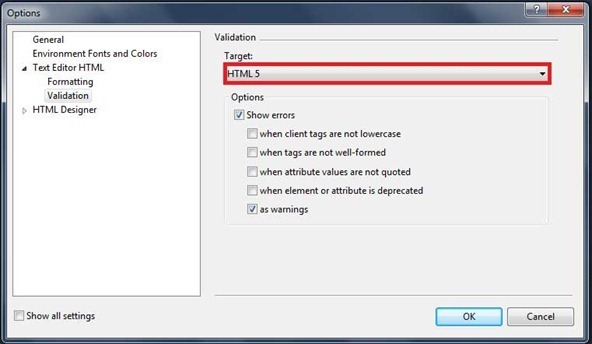 On the right panel, select HTML 5 as the Target. Now restart VS 2010 and you should be able to code valid HTML5. Enjoy!